Let me start with my personal experience in the 1980s. If you don’t like “Marxist days” of East Asian scholars, you can skip the first and second paragraph. In the early and mid-1980s, when I was a university student in Seoul, lots of students sang this song especially during drinking. The song title was simply “song of hope (heui-mang-ga: 希望歌).” The song delivered the feeling of despair and despair. At that time, for the students who were still thinking that they are the main subjects of the reform (or revolution!) of society but that “the enemy” (in the vocabulary at that time) was too strong to overthrow. So despair and resignation was the normal feeling in everyday life. I will stop (self-)psychoansis. Although they talked about politics and society, university freshmen were just 18 or 19 year old and could not know what the world is about. So most of them sang songs in crummy pubs for self-consolation, with heavy drinking soju and maggeolli (rice wine). At that time, the only “recorded” version I could listen to was Hahn Daesoo’s recording in 1975 in his official second album. Put it simple, he was “Korean Bob Dylan” anmd you can sense what that means if you hear his voice. I will skip his story and come back to his music later on. In the 1980s, university students took it for granted the song is one of “orally inherited” Korean folksongs. Looking back, three meter rhythm and pentatonic melody line did not make them (including me) throw doubt about the origin of the song. As you might know, traditional Korean folksong was based on pentatonic melody and 3 meter. After 1990s when students did not sing the song any more, I got to know that the melody of the song came from Japan and that Japanese also adapted British melody to Japanese lyrics. To be more exact, the melody was exported to America (US) and was transformed into a Chiristian hymn title “Garden.” I found out two scores of a song inserted in a paper which one of my Japanese friends kindly shared. I also could discover two version of the song by searching in internet: the one is American hymn version and the other is Japanese instrumental version. Unfortunately I don’t know much about the detailed information. What I’ve heard is that Japanese version was created for the requiem of the high school students who were drowned in the sea in 1910. The lyricist was a female teacher who worked in the region. 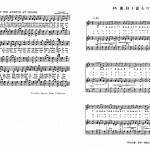 The song title was stabilized as “The Root of Mashiroki Fuji no-ne (White Snow in Fuji Mountain).” About the short introduction about translation and “mistranslation” of the song in Japan, please see http://duarbo.air-nifty.com/songs/2007/10/post_0c08.html (in Japanese). The first recording version in Korea (around 1925) is more interesting at least to Korean people, including me. It shows how it was difficult for Korean singers to adjust Western scale. Their singing sounds like “ethnic music” or “world music.” The song became one of the objects of the early recordings of “Korean folksong (minyo)” in the 1920s. One of the singers (woman) was Gisaeng (Korean Geisha) who were specialized in traditional vocal music like pansori. There were a couple of other versions of this song during 1930s, but I will skip over these points. 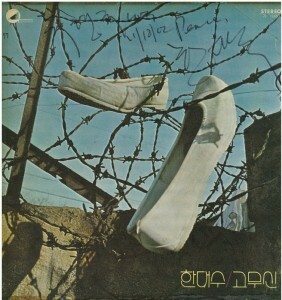 Hahn Dae-soo’s version was recorded in mid-1970s and it shows that the 1970s was as hard as 1930s to ordinary people as well as to students . The song actually tells that “there is no hope,” though the society was modernizing itself. Beside him, many Korea popular singers, especially who identified themselves as “folksingers,” recorded this song. There are one recent film and one TV drama which feature the song. 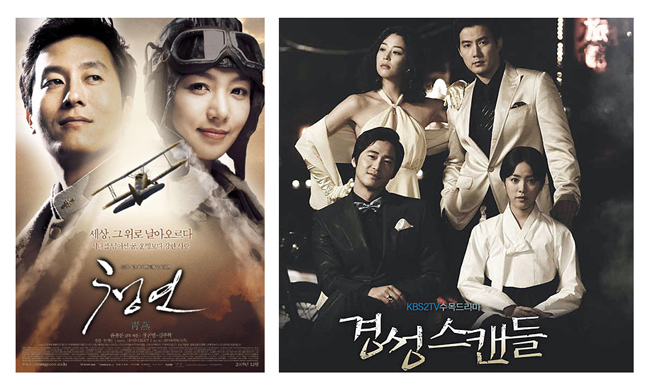 The one is Cheongyeon (Blue Swallow, 2006) which was about the first Korean pilot in Japan and the other is Kyongsong Scandal (Scandal in colonial Seou, 2007l). In the film, the song was inserted as orchestral background music when the hero and heroine firstly knew that they were Korean (Chosun-jin). In the latter, the heroine (Han Go-eun features as Song-ju) sang the song. Please enjoy. In conclusion, it is interesting how an English melody traveled to Japan and then to Korea. This kind of “transculturation” shows that something similar to “globalization” already happened in the 1929~30s. I know we need much discussion for arguing like that. Anyway what was though to be purely “national,” was actually the product of the complicated international or transnational cultural flows. “Transnational production precedes national production.” And the song enjoyed lasting life at the receiving end of the flow. ← Playfully becoming Chinese: making up ‘Asia’ in SEAsia?